Bio-syncretic robots, consisting of living biological materials and traditional electromechanical systems, have attracted lots of attention due to the potentialities of self-sensing, self-actuation and self-repairing with intrinsic safety and high energy conversion efficiency. However, most of current researches focus on the movement of the devices, and have ignored the study on the control of actuation unit cells, which is as important as motors for traditional electromechanical robots. In this work, the effects of cell culturing time, seeding concentration and functional drugs (cytochalasin and adrenalin) on contractile frequency and force strength of cardiomyocytes have been studied using scanning ion conductance microscope (SICM) and arrays of micro-pillars made of PDMS. This work will lay the foundation for the further study of quantitatively control of bio-syncretic robots actuated by cardiomyocytes and is also meaningful for the development of cytology, medicine, and clinical science. Diagram of Circularly Distributed Multiple Electrodes with AFM. 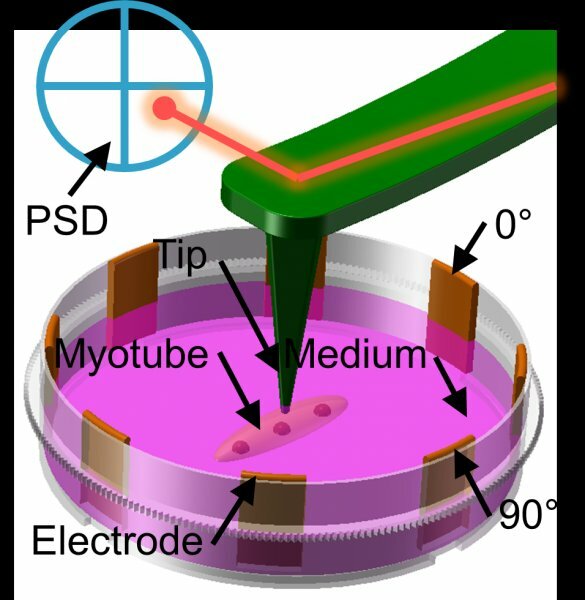 The electro-responsive beating behavior of myotubes were studied with the proposed circular electrodes.